I am so looking forward to the coming holidays and 11 days of vacation beginning tomorrow. I haven’t taken such a large amount of time off, without traveling since winter break in college. I plan to visit with family and friends, catch up on some reading, and sleep! It won’t be all play and no work however, as I have a huge to-do list, with redesigning fresh365 at the top. We will see if snuggling in bed wins out and how much actually gets done. Either way, I am very excited about the coming year and can’t wait to share all my plans with you—whenever they arrive. I hope you have a happy and safe holiday. Much love! 11 days off?! You lucky gal! Enjoy every minute and have a wonderful holiday. Happy Holidays, Erin! And enjoy your time off. And like I've said before, I drool every time I visit. Looking forward to more recipes in the new year. Enjoy your break and have a very Merry Christmas! Merry Christmas, Erin! Have a lovely break. I should try that out sometime, using vacation time without actually traveling.. sound great. Can't wait to see what you cook up, design-wise. Have a wonderful Christmas, Erin! I am sooo making that risotto! Enjoy your time off! A blog redesign does not sound very relaxing...but it can be inspiring and creative too. Enjoy that time away. I can't imagine how you'll rethink the blog, I think it's just perfect as it is. Good for you for taking time off! 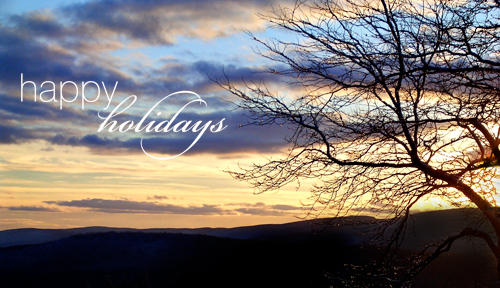 I hope you have a wonderful holiday and a very happy new year to you! Hope you have a fantastic time off! Merry Christmas! I hope it was bright and merry for you and yours. Happy holidays and love to you!